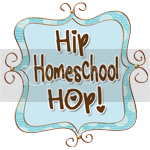 Wow -- today at The Homeschool Chick I've been featured on the Hip Homeschool Hop post. I love this site and get so many wonderful ideas from the bloggers that link up each Tuesday. So, please visit and get some inspiration! Last week we made our trip to the library and stocked up on as many Christmas books as we could find. While I was browsing, I came across a copy of The Best Christmas Pageant Ever and also was able to find the DVD to go along with it. Let me tell you -- this has been so much fun for us this week! I didn't plan this activity, it just kind of fell in my lap, and I'm glad it did. The Herdmans are the meanest, nastiest group of six unruly siblings in town. They'll ruin the Christmas Pageant for sure ... or will they? This is a chuckle-on-every-page, action-packed account of how one town deals with the biggest Christmas-pageant challenge in their history. Meet the Herdmans--six awful kids and one stressed-out cat, all prone to mischief of the worst kind. Like the time they set fire to Fred Shoemaker's toolhouse while playing with a stolen chemistry set, or when Claude Herdman "emptied the whole first grade in three minutes flat when he took the cat to Show-and Tell." The Herdman kids attend Sunday school only because they think they'll get to eat cake there. Once Christmas pageant plans begin, they intimidate all the other children into letting them volunteer for the biggest parts. When the town reacts with horror to the news that the most sinful children will be playing the holiest roles, the pageant director becomes even more determined to make it work. Even though they look more like trick-or-treaters than Bible figures, the Herdmans don't ruin the pageant; instead, they improve it, and give the story a surprisingly sentimental ending. After we read the book and discussed, then we watched the one hour movie. It held so true to the book, and was quite comical. A word of caution: There are some mildly offensive words and situations in this book. I think Common Sense Media recommends it for ages nine and up. My kids, however, didn't latch onto this aspect of the book, and we did have a great discussion about the Christmas story, and followed up with a reading of the Christmas story from the book of Luke. I must admit, this is about the extent of our schooling this week - we're pretty much on break! My children have been attending a Christmas camp at a local arts studio and gymnastics academy. It is 9-1 each day and they have played, jumped, made crafts, and just had fun in general. I have loved having some time to run errands and catch up with a dear friend. Tomorrow is the last day - my husband has the day off and we are going to spend it together (what a novel concept!). My children have really enjoyed themselves, too.... so I feel good about leaving them for those four hours. Look at this clever cupcake ornament Miss B made yesterday. It is made with spray insulation and spackle! How clever is that? It sounds funny to say, but I appreciate the "socialization" they are getting there - and by that I mean the chance to meet new children, adapt to a new situation, and see that they can succeed and enjoy themselves in different settings. Most of the children there are public or private schooled children and I think it is good for my kids to associate with ALL children. AND, I think that three mornings is the perfect amount of time.... then I'm ready to have them back at home until a couple of different summer camps occur. Thanks for stopping by my blog - if you're here from the Hip Homeschool Hop, please leave me a note to say hello! I wish you many blessings during this Christmas season!